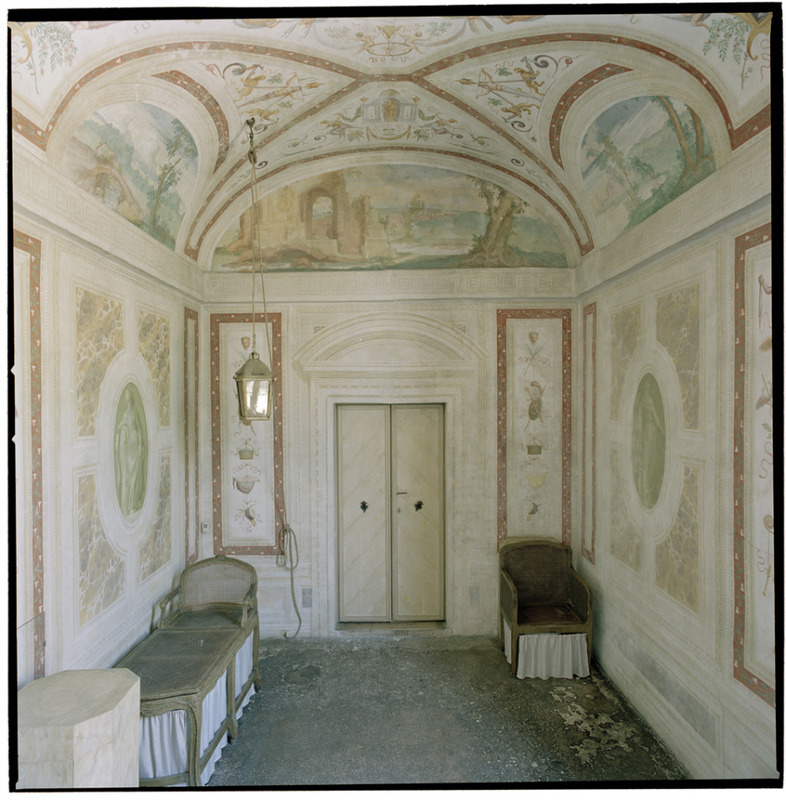 Besides the luminosity, another surprise when you enter the house is the fact that all its walls and vaults have frescoes. The other rooms forming the two apartments on the sides also have frescoes. Palladio did not like decorations of this calibre. Painting is so striking and endearing that it detracts from the architecture as it is itself a medium. 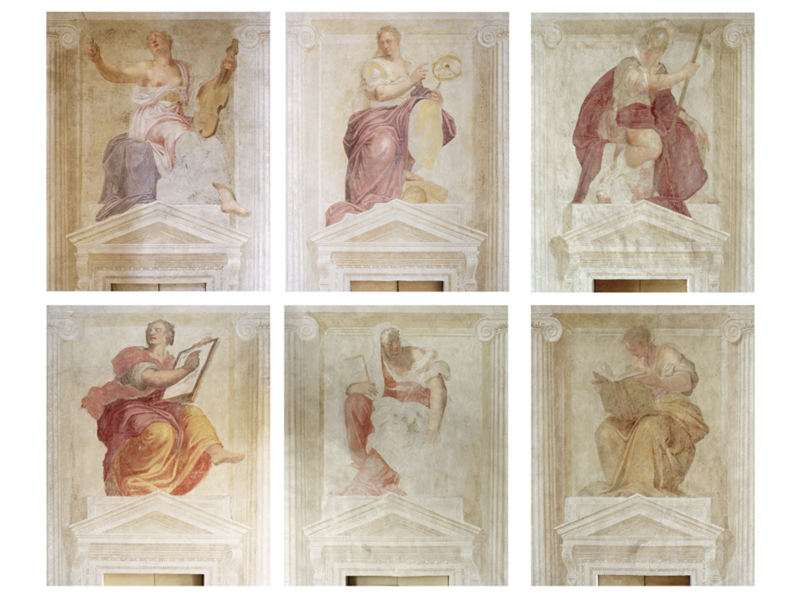 Palladio decorated only the walls of the central room. 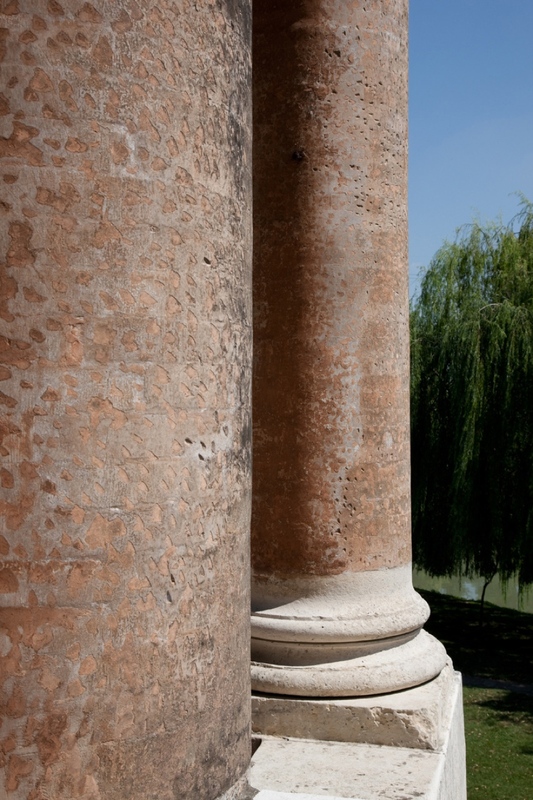 He praises the “extraordinary paintings” by Battista Zelotti marked by grooved Ionic columns. This appreciation is mainly limited to the representation of other arts in the painting: literature, represented with a hand holding a book; war (Bellona), which we can admire through the helmets over doors that gives access to larger rooms; music and astronomy, particularly violas and sextants over the doors that give access to square rooms; and geometry, which is represented by signs on a table, and arithmetic with a hand holding a set square over the doors that give access to the smaller rooms. The decorative art that we can observe on all the walls, the vaults of the rooms, and the central room, was not done all at once. It was finished over a period of time and gives us a unique artistic quality showing the different moments in family life that occurred in the house between 1557 to 1575. 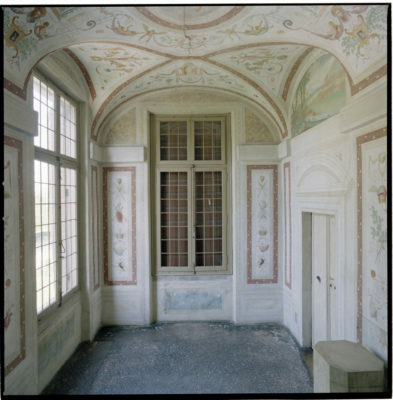 The decoration of the different rooms was started by the unmarried brother, Alvise. He summoned Battista Franco, a celebrated painter, who at that time was hired by Palazzo Ducale. The decorating, which starts in the larger eastern room (entering the arcade at the left of the Prometeo) would not be finished due to the death of the painter in 1561. 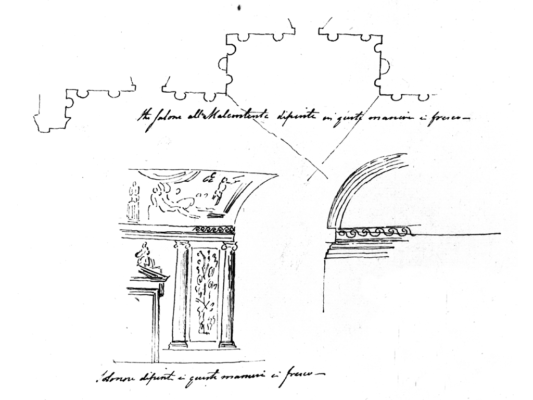 Battista Franco did not complete the decoration of the square room, the one we see after passing through the Prometeo room. Alvise decided to complete the room in an iconographic theme, The Fall of Giants. 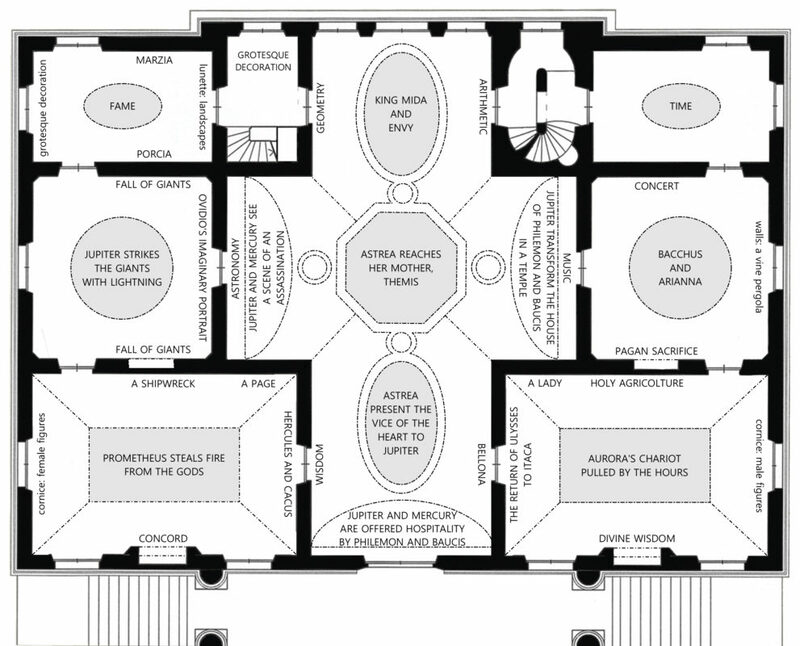 The same symbolism that Giulio Romano had already used in the square room of the magnificent suburban mansion, called Palazzo Te. 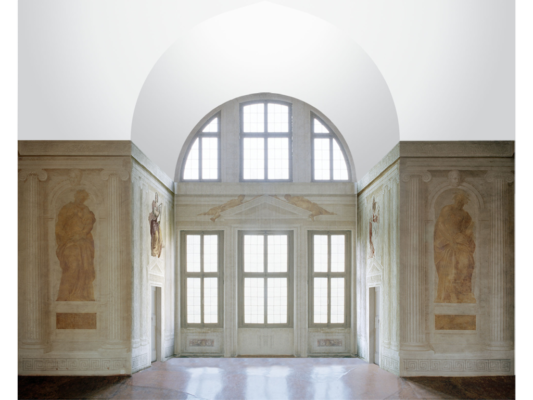 This Palazzo Te was built by Gonzaga, who lived not far from Mantova. The decoration of the rooms, the one done as Baccus the God of wine; the other dedicated to Aurora, needed to underline the central agricultural ethos of the house. 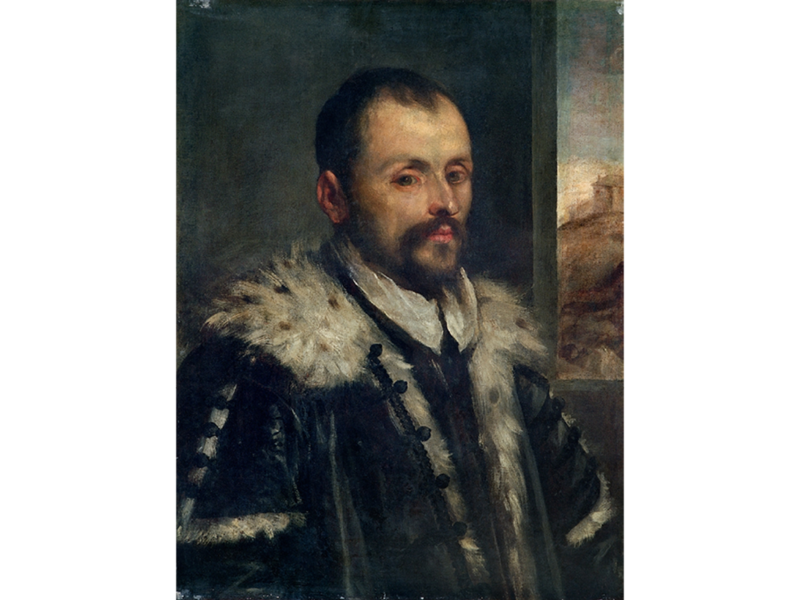 Later on Alvise married in order to provide an heir for the Ducal branch of the family. After that, his brother Nicolò died. In the first part of the decoration, the choice of the iconographic is taken from Ovidio’s Metamorphosis; then, it becomes more varied. Alvise did not hesitate to choose themes that were more autobiographical. 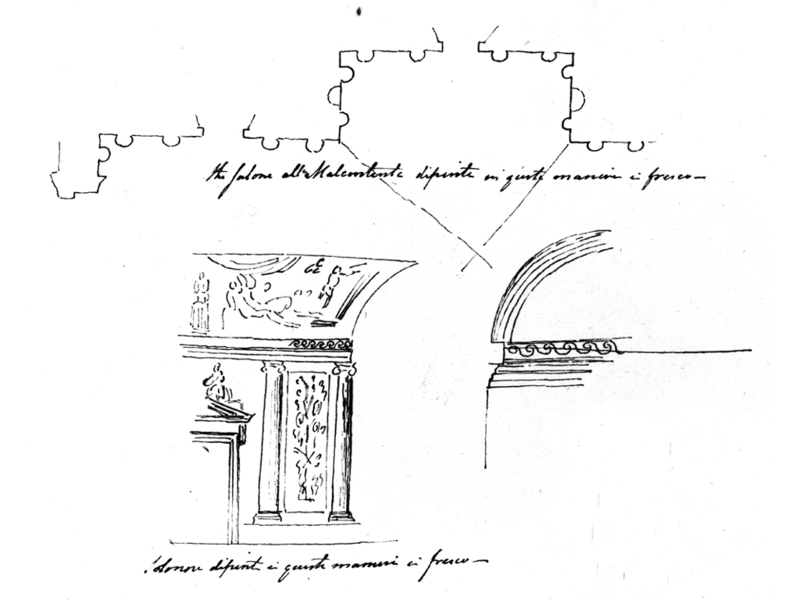 Once finished, the decoration of the smaller rooms were done by Bernardino India. At that time, he was the most accredited painter for grotesques, which is a type of decoration that the ancient people from which the Rinascimento period drew inspiration during the archaeological excavation of Nerone’s Domus Aurea. 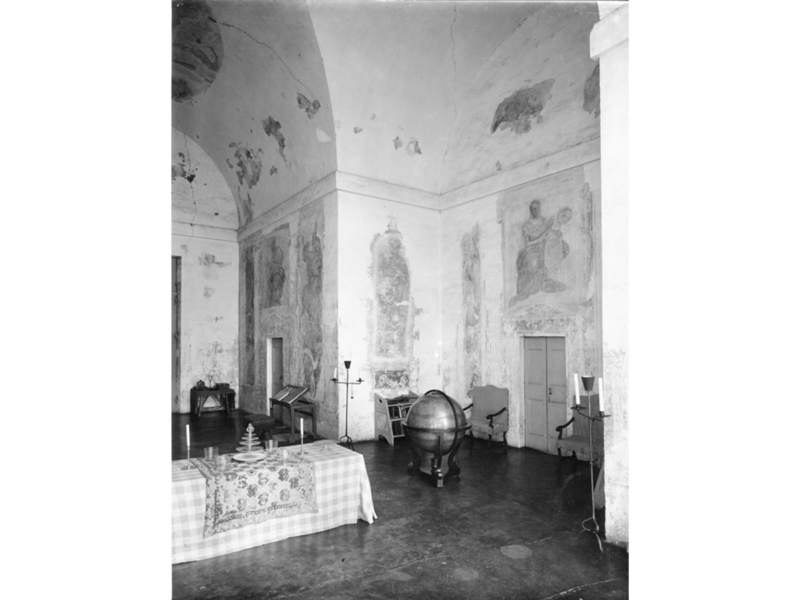 It is the only surface to the Piano Nobile that hasn’t been painted with frescoes, the one with the vaults in the central room; therefore, we should look at that again. The pretext for dealing with the decorations of these vaults was the arrival of the king of Poland, Enrico III of Valois, at this house in Venice, which he visited in 1574. He was hosted at Ca’ Foscari, Alvise’s Venetian residence, which is now the seat of the University of Venice. 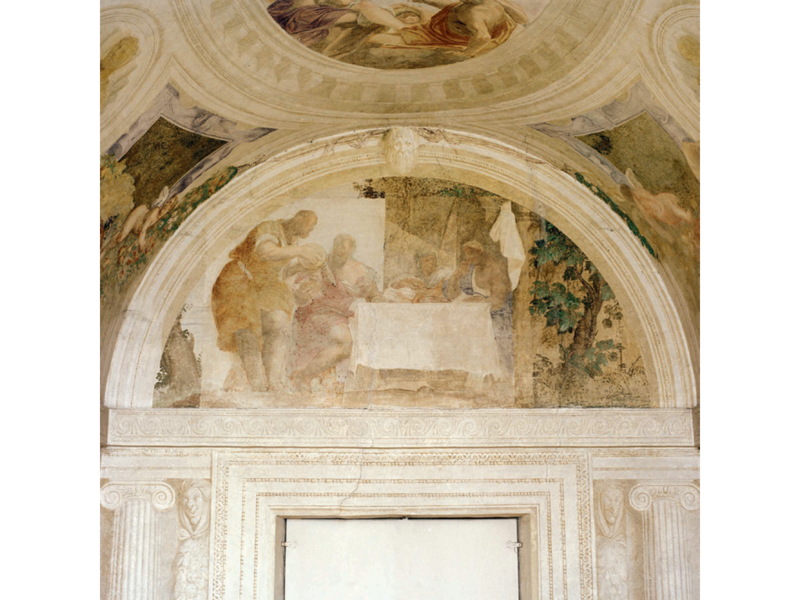 The representation of the dinner that Filemone and Bauci generously offer to Jupiter, king of the gods-which we see painted over the large door that gives access to this room-, is intended to evoke the hospitality that Alvise and Elisabetta Loredan, offered to the King of France in Venice when they welcomed him to this house, making this the first stage of the triumphant journey that would lead him from Venice to Paris to receive the crown of King of France. 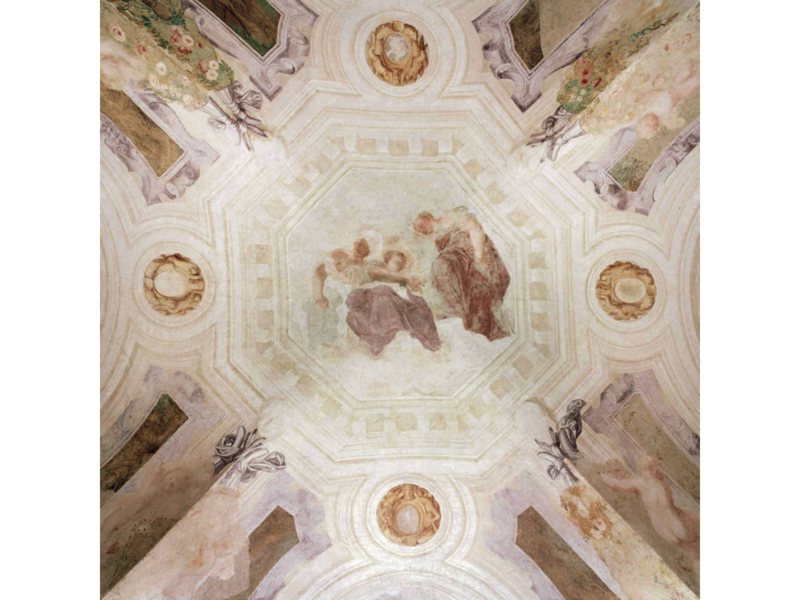 The last effort of Battista Zelotti, the painter, who had been familiar with this architecture for over twenty years, was the decoration of the vault of the central hall, on which was depicted works that resembled the patterns of the new ceilings of the Ducal Palace. Among these paintings is the story of Astrea, the virtuous goddess who ascends to Olympus, leaving behind a world in which vices and selfishness are now spreading. And in Olympus, she joins her mother Teti, the goddess of eternal laws, who appears solemnly in the central eight sided area. If all of these frescoes do not still have those vivid and intense colours that they had when they were painted, it is because they all have suffered, a series of “tears”, right after the house was left by Foscari, in the second decade of the nineteenth century. When this real pillage was completed, all the walls were covered with a lime wash. 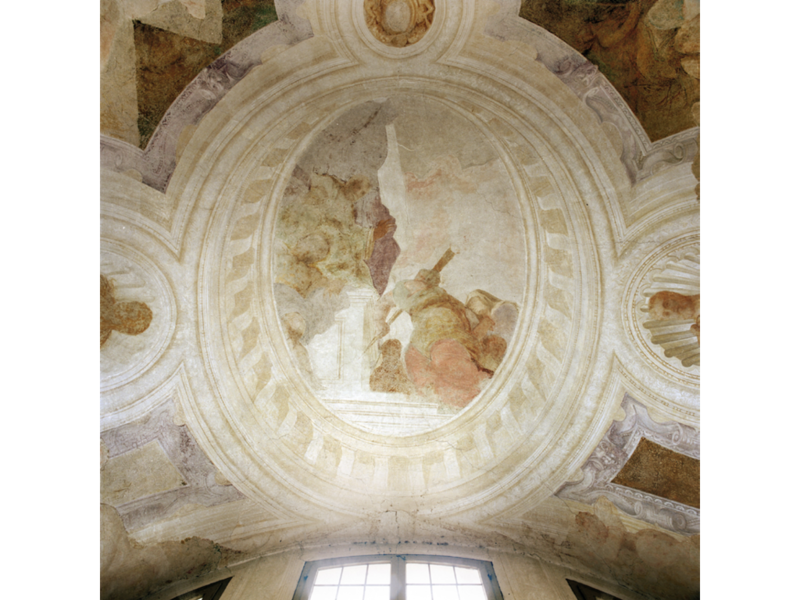 Removing this layer of lime and the restoration of what remained of the original frescoes is the result of patient restoration work that ended only in the seventies of the last century. The result of this work is remarkable because it does not prevent the appreciation of painting and it reduces that conflict between the two media – architecture and painting – which Palladio tried to avoid with his designs.